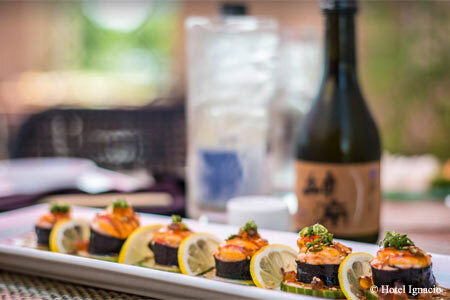 A sushi and saké experience in Midtown St. Louis’ only boutique hotel. : Baiku by day is all about business lunches, with bright sunshine and eye-catching art like whitewashed, deconstructed engine parts (Baiku means motorcycle in Japanese). Nighttime brings couples sipping cocktails while nibbling sushi and getting better acquainted under the glow of multicolored lights. From the décor to the saké list (curated by an international expert), great care went into every aspect of the customer experience. Nigiri and sashimi from chef Soung Lee are likewise well-crafted and fresh. Among the maki, unagi is a simple favorite (freshwater eel, cucumber, avocado and sweet soy reduction). But trends dictate elaborate specialty rolls, too, and Lee delivers with creations such as Shred415 featuring eight ingredients including striped bass, gobo and shredded beets with a jalapeño-thyme-lemon vinaigrette. Warm dishes are prepared in Hotel Ignacio’s kitchen. Look for lobster dumplings in dashi ramen broth, shiitake pot stickers and specials of salmon with sea urchin roe “butter.” To end the meal, opt for miso cookies with orange-ginger glaze.